members' home page | cloudeight home page | infoave home | our forum | our rants | questions or comments? Welcome to the Cloudeight's "Folk Art by Martine Clouet" screen saver home page. We are pleased to present this screensaver to you featuring the fine art of Martine Clouet. Martine of Paris, France, is self taught and we are honored to share her art with you and her poetic look on life. 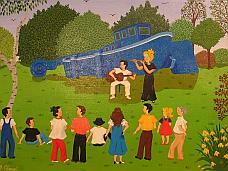 She offers a beautiful variety of folk art so please take a moment to tour her online gallery. Do you know how to add fun to your e-mail with just a click? You do now! Meet the Smileycons! Thanks for being a Cloudeight Member! We appreciate the support you give us! Thanks for visiting Cloudeight! All content is copyright © 2005 by Cloudeight Internet LLC. Original art used in this screen saver is copyright © Martine Clouet and are used by written agreement. Visit Cloudeight at http://www.thundercloud.net All rights reserved. Cloudie Mascot logo is © copyright 2001 by CloudEight and is an original design by Dennis Cox, official Illustrator for Cloudeight.